I am a qualified TV engineer of over thirty years experience, I cover all of West Somerset. Being a mobile service most of my work is done in the customers house, removing the need to transport the TV to me, in fact this is often preferable from my point of view as 90% of faults that may seem terminal are actually caused by poor set up or faulty connection to another piece of equipment. I can also receive repairs by prior arrangement at my home or workshop. 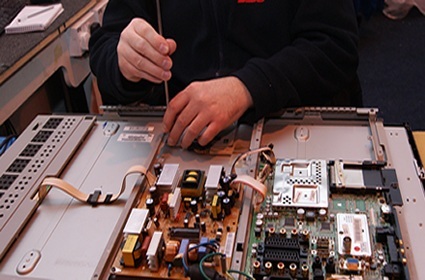 I come across genuine faults on televisions every day that may be considered terminal, this is seldom true with repair costs falling well short of the cost of a new TV. Unfortunately, without the proper advice, very good easily repairable televisions end up in the skip only to be replaced with something that may look nice and stylish but will certainly lack the quality and reliability of an older TV. I suppose the question everyone asks is “To repair or not to repair” when something happens to the TV, DVD, Sky box etc. It seems far too easy to pop down to the local high street retailer and pick up a new TV for very little money in comparison to a few years ago. Now you can get a 40″ Bush for just over £200, ridiculously cheap for the technology involved. However, to make things this cheap, corners have to be cut, trusted manufacturers using cheap Chinese components to be able to build down to these kind of prices. A ten year old TV may go on for another ten years, not true of the new generation. A case in point, it took two of us to lift a 50″ Samsung into my workshop, yet a few days later I was called to install a 50″ Toshiba, I was able to lift this TV out of the box easily and unaided. This is because all the quality has been removed from the product, the backs made of flimsy plastic, no real protection on the delicate screens and the panels inside reduced to the absolute minimum required. All this results in something that produces sub standard sound and pictures from components only just man enough to struggle through the guarantee period…the picture on the new Toshiba was rubbish by the way! When LED screens first appeared they were using very good quality LED’s that gave good reliability, now they are replaced with inferior Chinese sourced LED’s that fail by the thousand and even occasionally burn up, all in an effort to shift as many TV’s at a knock down price as possible. Never was the old phrase “You get what you pay for” more true! As an example I have just taken on a 32″ Bush purchased from Argos, it’s lasted 14 months before failing, but repairing this TV is still preferable ( and cheaper ) to replacing it with something of even poorer quality. My advice would always be to attempt repair, better to keep a good quality TV going than replace it with something inferior. If repair is not possible then at least I can advise on the best replacement.